I hope to never have three days like we had a couple weeks ago. My mother died on a Sunday, and then suddenly my cousin Carol died two days later. It was almost too much for our brains to process. We are all beginning the difficult road to normalcy but it will take a while for it all to sink in. We decided to hold a combined celebration of life service, as mom and Carol loved each other very much. Yesterday, Carol’s daughter Colleen came by so we could talk, and she brought along boxes of Carol’s cookbooks. Colleen is having the difficult task of going through Carol’s house and decided Carol would have liked for me to have her books. They are all very special and I love knowing these were Carol’s. In addition to these two boxes of books, there were a couple of treasures. Those cookbook collectors who are familiar with the great Bakery Lane Soup Bowl cookbook, may not know of a follow-up book. I had no idea and here it was in Carol’s box! 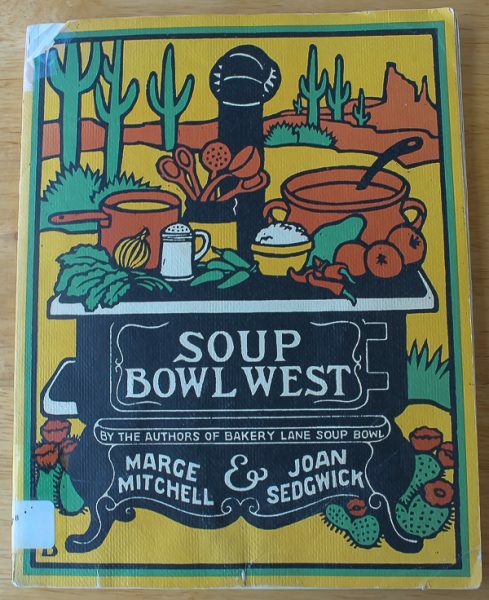 Their Soup Bowl West was published after the authors left cold and snowy Vermont to live in sunny and steamy Arizona where they opened another restaurant. It still featured their famous soups and salads, but many recipes with a Southwest twist. 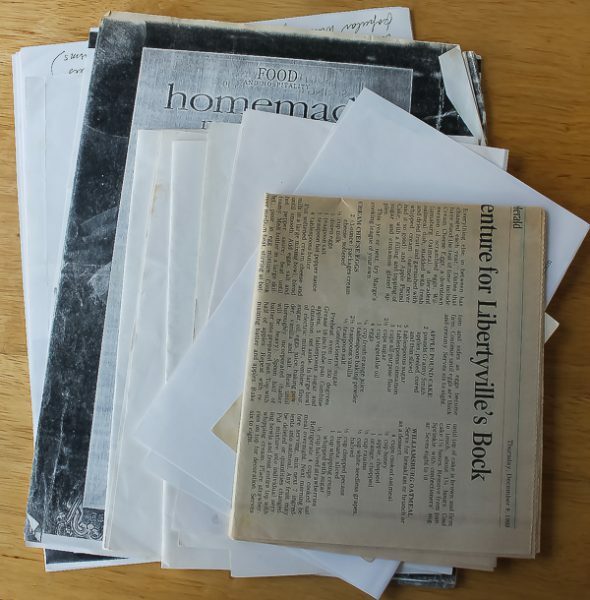 The other treasure was a packet of loose recipes and cards, some of them recipes that I had printed out for Carol many years ago. There was a canning recipe from a cousin of our grandmother. There were reprints of recipes that were experiments for the Pillsbury Bake-Off. I had piles of those in my basement but all were lost in the flood. Now I have a least a few back. 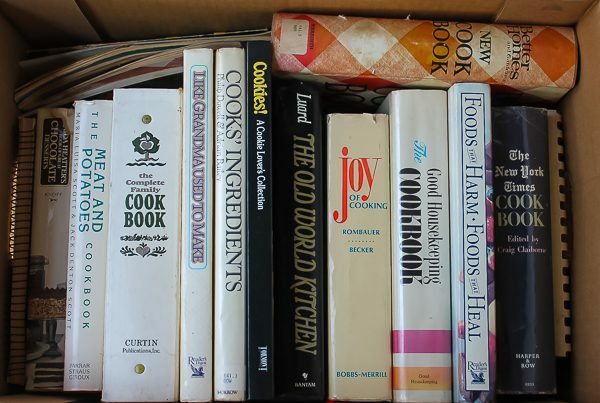 All of the cookbooks mean so much and goes to show how family love for cooking, cookbooks, and recipes are handed down. Carol and I grew up together and spent many treasured family times between her childhood home, my childhood home, and times in Iowa with our beloved Great-Aunt Margery, where we watched her cook and learned about the basics of Iowa farm gardening and cooking. All of the cousins had a ball growing up together and we remember those times with great fondness. This is me (what am I wearing?) 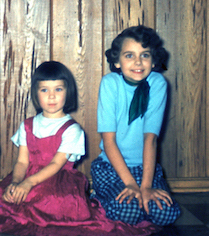 with Carol (on the right) playing in our basement, probably around 1955. Carol will always be remembered for her love of animals, the outdoors, reading, movies, gardening, and canning. 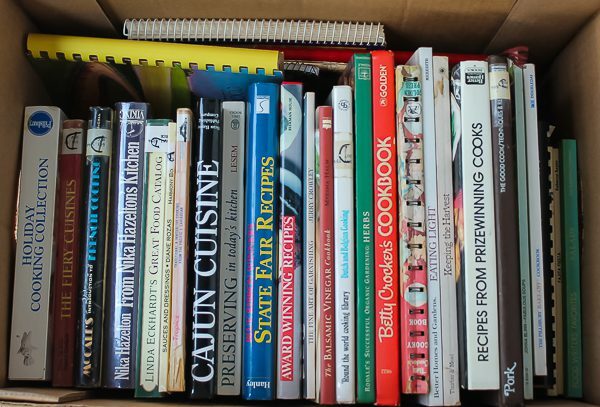 There will never be a time when I cook from these books that I won’t think of her. She was loved by many who will miss her. I know Carol and my mom are happy in Heaven together, and probably cooking and gardening with our grandmother and Aunt Margery. So sorry you had such an awful 4 days a couple weeks ago–but how wonderful that you had a combined celebration of life ceremony. So glad both of them will live on in your cookbook collection and whenever you make one of their recipes. I can’t think of any better tribute to them. Thank you, Barb. Both my mom and Carol will definitely live on in their cookbooks. I will always have their notes tucked into the books, and the well-worn pages of recipes they loved. You have a beautiful family, Debbie! Thank you, Mary. I owe you a huge letter. Lots to tell you. I’ll write soon. Your photos of Carol’s books are like looking at old friends. Friends and family will help us weather and carry on. My sympathy for your losses. My prayers for Blessings to come. A new baby on the horizon, all will be well. Dearest Elaine- You are so kind and wise. Thank you for your words. Books are certainly old friends and can bring comfort in their own way. So sorry for this time of loss and sorrow. May you find strength and joy in the many wonderful memories of your loved ones and in the support of those around you, and in the assurance of God’s great love and grace. What a treasured keepsake to have your cousin Carol’s cookbooks on your shelf. Those Bakery Lane Soup Bowl Cookbooks sound wonderful, especially since it is soup season. I look forward to you sharing some soup recipes. Kim, thank you for always being there for comfort and prayers, and for being my friend all these years. If I ever find a Bakery Lane cookbook, I’m sending it to you. You would love it! That’s great!! A real classic and favorite of many. I love that cookbook!